Demand for private company shares declined in the second quarter versus the first quarter but was up sharply year-over-year, according to a new report released today by SecondMarket. The market for private company stock saw $112 million in transactions last quarter, versus $156 million in the first quarter, or down 39 percent sequentially. On an annual basis, however, it was up 120 percent over the second quarter of 2010, which saw $51 million in transactions. And the $268 million worth of transactions in the first half of 2011, was up 75 percent from the first half of 2010 . Some of the tempering of demand over the past couple quarters can be attributed to the fact that two of the previous most popular stocks on the market, LinkedIn And Pandora, went public so investor demand simply shifted to the public markets. Demand for shares from new startups filled much of the gap, but was not enough to keep transaction volumes growing compared to the previous two quarters. Nearly 88 percent of completed transactions were for consumer Web companies, and hedge funds accounted for 22 percent of the dollar value, but only 5 percent of the number of transactions. Individual accredited investors were the largest buying group, accounting for nearly 48 percent of total dollar value and 62 percent of number of transactions. Former employees were the biggest sellers (accounting for 94 percent of transactions). The top 10 most watched stocks (members can add any stock to their “watch list”) remained pretty stable, with Facebook, Twitter, Groupon, and Zynga in the top four slots. Foursquare moved up to No. 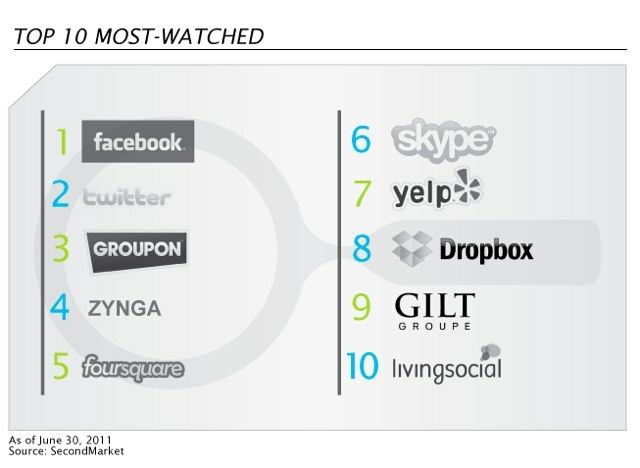 5, followed by Skype, Yelp, Dropbox (new), Gilte Groupe, and LivingSocial (new). LinkedIn and Pandora fell off the list as a result of their successful IPOs. 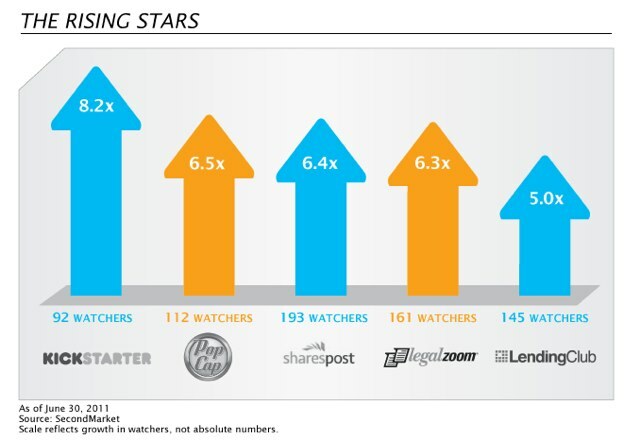 The Rising Stars gaining the most watchers were Kickstarter, PopCap, SharesPost (SecondMarket’s biggest competitor! ), LegalZoom, and Lending Club. PopCap was just bought for $1.3 billion by EA, and LegalZoom raised $66 million from Kleiner and IVP. SecondMarket also tracks a group called “Newbies” which are showing early traction in terms of attracting investor attention. The Newbies in the second quarter were SurveyMonkey, Coupons, Hipmunk, Justin.tv, and Yousendit. Finally, the report also pulls out the most watched international companies. 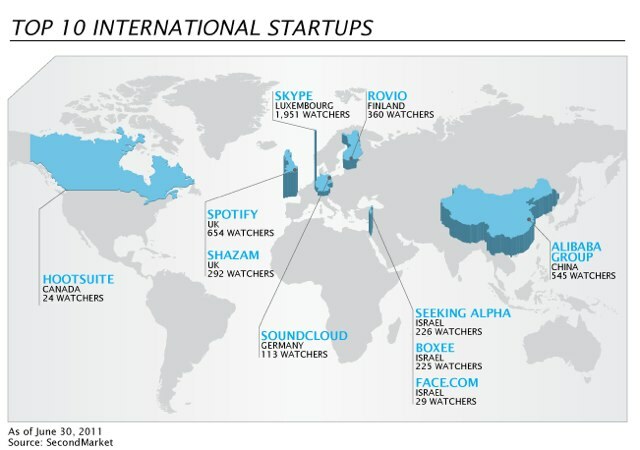 These include Skype and Spotify (of course), Rovio, Soundcloud, and the Alibaba Group.